Rock Star Tri: My journey back to the endurance world frequently interrupted by life : My friend, my enemy. This morning I got on the scale. Getting on the scale seems to be part (step #5 - I'll let you try to guess the others) of my morning ritual and has the ability to influence my day postitively or negatively based on if the scale is my friend or my enemy. My weight fluctuates day to day, as expected, but all seems right with the world when the scale is my friend asI see the results of eating right and balancing training load. In contrast, when the scale is my enemy, the world is chaos when I'm doing all I can do with no (or even worse negative) results. 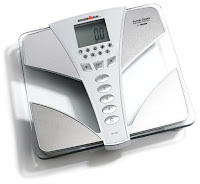 The scale today was my friend as I hit a new low. In the last 11 weeks I lost 10.6 pounds. Maybe I've broken through the plateau that I've had but most importantly I need the scale to continue to be my friend for the next few weeks leading up to EagleDay, 6/14.